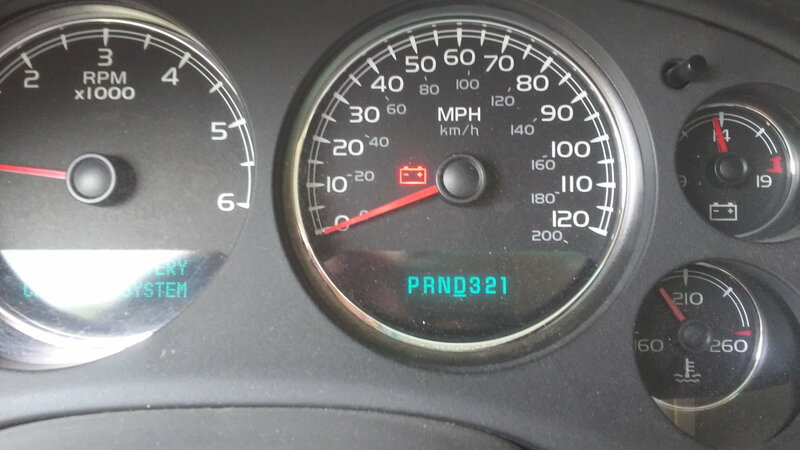 07 Tahoe Battery light on, please help!!!! Tahoe & Suburban The power, space, and brutal towing ability make the Tahoe and its longer sibling, the Suburban, arguably the best full size SUV's on the market today. why is this light keep turning on? What would it be the normal reading for a battery and alternator? I've noticed the dash and radio slightly flicker, you can barely noticed, but the flickering is there...does this have anything to do with this light turning on may be? I know nothing about what's under the hood, but I've managed to change the belts and now the battery, by myself, tired of paying the dealer stuff I can do. welcome from maryland. the needle is pointing to about 13v even though it looks like it should be 14 its really 13. which would correspond to your multimeter reading. when you wrote "battery 12. something (can't remember) and alternator 13.69/70" do you mean it was reading 12.6 not running and 13.70 running? IME, your alternator is running a bit on the low side. Almost all my Chevys (and I have owned and worked on many Chevrolets of all kinds) the alternators will put out over 14 volts.My old Chevy C-1500 would put out 14.9 volts but that's a bit on the high side as 14.2 is the "perfect voltage". You might have a bad voltage regulator (which is located inside the alternator) but I think you "might" have a slipping serpentine accessory drive belt or a weak belt tensioner. Luckily for you, the belt and alternator are easy to change on a forward mounted light-duty pickup motor. BTW you must check all your connections for corrosion before you proceed as corrosion could be the issue. If it's your alternator that's bad,, those are easy on pickups and other light vehicles (I don't call them trucks as I drive a semi for a living) Just disconnect the battery, get the serpentine belt off, disconnect the wires, remove the hold-down bolts (usually only two) and swap it out for a new or rebuilt one. Reverse the procedure and you are all done. The stock GM alternator is about 105 amps. You can go all the way up to about 160 amps, but they usually cost more as well. The 2007 and newer have the alternator output controlled by the computer for fuel efficiency. Get your battery and alternator checked. Most auto parts stores will do out for free. I suspect the alternator is the problem, also make sure the battery connections are clean and firmly connected. The 07's are known to have bad cables as well, consider replacing the negative cable. The cable can look fine but corrosion builds up between the copper and the ring terminal that connects to the engine block ( that is what was wrong with mine) after replacing the negative cable all my electrical troubles went away. 2008 Tahoe- Hub Assembly or CV Axle issue? All times are GMT -5. The time now is 6:56 AM.